You could be unwittingly leaking sensitive information every time you throw away a used hard drive. Learning how to recycle hard drives securely goes a long way to help protect you from identity theft. Data breaches can affect companies and organizations of every size and across every industry. In 2011, Sony’s PlayStation network was hacked in what would become the worst data breach throughout the gaming community. The hack affected the accounts of more than 77 million people – 12 million of whom also had their unencrypted credit card details released. In addition, the full names, email addresses, unencrypted passwords, and home addresses were released in the data scandal that shocked the gaming community. With many companies today wondering how to recycle hard drives in a secure way, the Sony PlayStation network data breach is an important reminder of what can happen when data security is not given the attention it deserves. Your hard drive holds a wealth of information – perhaps more than you realize. If you have ever used your computer to access Internet banking or log on to any secure system, your computer’s hard drives contains information that could be used to defraud you or steal your identity. It could be your social security number, tax records, credit card information, banking data, and much more. Worse, if the computer has ever been used for business purposes, improper disposition could be against the law. 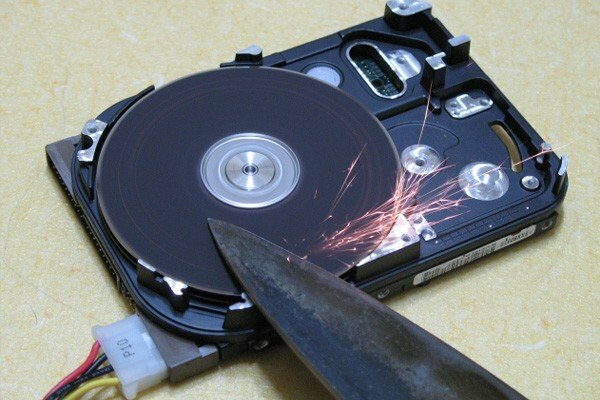 That’s why it’s important to learn how to recycle hard drives safely and securely. Simple electronic waste recycling may be viable in some cases but if you have highly confidential data on your drives, it won’t be sufficient. 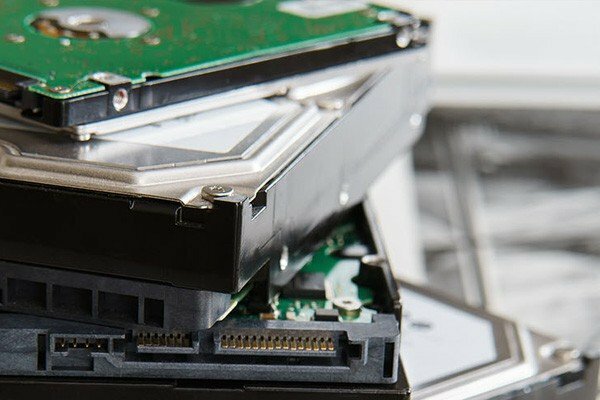 To protect your business, clients, and reputation, you must choose methods that guarantee total hard drive destruction. How Do You Dispose of a Hard Drive? When home PC users think of hard drive disposal methods, they tend to look at hard drive formatting, hard drive erasers, and physical destruction using hand-held tools. However, none of these methods are sufficient for corporate equipment, and none of these methods are guaranteed to make data irrecoverable. Even basic forensic programs can retrieve most of the data on the hard drive in each of these cases. When dealing with hard drive disposal at the business level, you should only consider professional grade solutions. Degaussing is the process of erasing data from a hard drive using high-powered electromagnets to alter the magnetic domain of the drive. Most hard drives transfer data by means of magnetic fields. When they’re destroyed, the data becomes inaccessible. Modern degaussers can induce such powerful magnetic fields that can physically damage the hard drive as well. Shredding a hard drive entails using a mechanical device to physically break the drive into pieces, which are then discarded securely to ensure absolute data destruction. Professional grade shredders ensure that the hard drive is broken beyond the point at which the data could be recovered, which at a minimum involves severing each track on the drive’s platters. Direct physical destruction of a hard drive gives instant proof that the data held on the drive is completely obliterated. 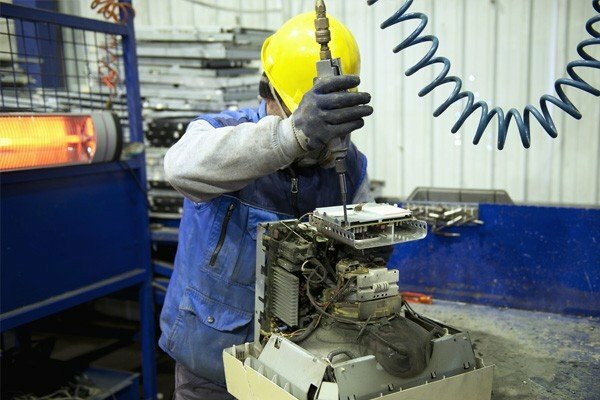 There are many ways to destroy hard drives physically, but professional data destruction experts typically employ mechanical crushers that can deliver astounding amounts of force to ensure that data recovery is impossible. Not only can recycling hard drives be a secure way to dispose of old drives, it is also environmentally important. On the other hand, there are various methods of hard drive recycling, so your primary concern should be how to recycle hard drives securely. Take measures to wipe all data on the drive and eliminate all possible ways that it could be recovered. Professional data destruction companies use industrial-strength, specialty tools to wipe hard drives clean before recycling. Almost all hard drives and computer parts are recyclable, so give recycling a chance whenever you want to dispose of an old computer or hard drive. Typically, with recyclable household items like whitegoods, you could either take them to a collection center or they could be picked up from the curbside according to the recycling schedule in your local area. However, this isn’t the case for hard drives as they can contain sensitive that – in the wrong hands – could lead to serious identity theft issues. In addition to holding potentially sensitive data, some hard drive components comprise toxic elements such as lead and mercury. When wondering how to recycle hard drives, know that the best solution is to take used hard drives to certified hard drive recycling centers for recycling. Find out how All Green Recycling can help your business avoid a data breach, and contact us today.